Located in Greensboro, North Carolina, the Greensboro Children’s Museum is a hands-on and interactive museum that encourages visitors to explore, discover, and experience the exhibits up-close and personal. Children and their families from all backgrounds will be allowed to touch, climb on, and even talk to the exhibits to make learning more fun and creative. The Greensboro Children’s Museum was started by Jerry who, after traveling to children’s museums around the world, wanted to bring this joy to the people of Greensboro. He began to share his vision with community leaders and finally a committee was launched by Cynthia Doyle to gain funding for the museum. The museum was opened on May 15, 1999 on 220 N. Church Street. More than 37,000 square feet going by the name of Our Town allows children to role play with their families and participate in a variety of realistic and hands-on exhibits. There are many different areas to explore in Our Town, including: Main Street, The Market, Pizza Pan, Our Town Theater, Gizmos & Gadgets, Get Out & Play, Plane Exhibit Area, Train Depot, The Health Center, Bloomingtales Bookshop, Tot Spot, Nonie’s House, Creation Station, Media Room, Construction Zone, Campsite, Post Office, and The Edible Schoolyard and Teaching Kitchens. Each area offers something new and exciting for children to discover, and the best part is – everything is their size! They can go to work on Main Street, shop for groceries at The Market, put on costumes and perform at Our Town Theater, or even play doctor at The Health Center. 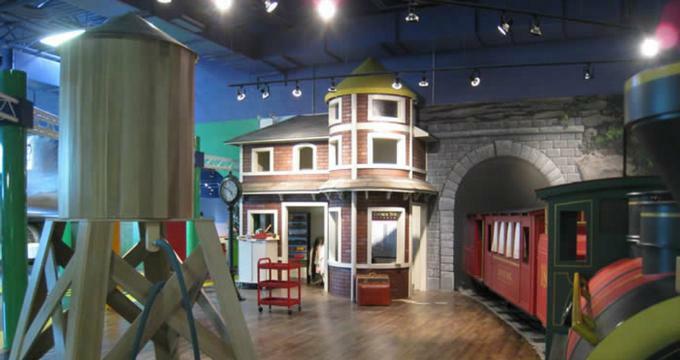 Visitors can express their love of reading and attend storytime at the Bloomingtales Bookshop, practice driving a train at the Train Depot, or even explore the inside of a real DC-9 jet airplane at the Plane Exhibit Area. For the younger visitors there is Tot Spot, a gated and safe area for children two years old and younger. The area is filled with soft blocks and a variety of toys, rides, and mats to play with. One of the most interesting exhibits is Nonie’s House, a 1930s Fisher Park replica specifically designed to be children’s size. Children can cook, clean, wash the dishes, harvest chicken eggs, and hang laundry, all in a house built for their small statures. For the budding journalist in the family, there is the Media Room. Children can practice anchoring the news and delivering the weather on a Time Warner Cable set replica. For the more creative members of the family, there is Creation Station, where visitors can draw, color, paint, and create a variety of unique take-home art projects. All of the materials are supplied by the museum, including the smocks to keep the young artists (fairly) clean. The Construction Zone allows visitors to practice building homes, while the Post Office lets them experience a day in the life of a postal worker. For the more outdoorsy type, the Campsite teaches children about camping. They can explore tents and other camping gear, roast pretend s’mores, and even tell campfire stories. The museum is proud to be the first in the country to have a licensed edible schoolyard and teaching kitchen. This area features lots of hands-on instruction in the process of planting, tending, growing, harvesting, preparing, and ultimately cooking food. The goal is to provide a deeper connection between the visitors and how they obtain their food. Summer Camp at the Greensboro Children’s Museum 2017: The most popular event at the museum is the annual hands-on summer camp! Children who attend will participate in educational and imaginative adventures related to cooking, art, music, gardening, and exploration. Children ages 4-14 are invited to attend and there are a variety of camp themes to choose from. In the month of June, camps that visitors can choose from include Pirates and Mermaids, Litter Farmers in the City, Fancy Nancy, Little Garden Yogis, Superhero Academy, Cooking on the Farm, Spy Camp, and Farm Chef Camp. In the month of July, camps that visitors can choose from include Harry Potter, Garden Friends, Once Upon a Time, Chef Basics, Magic Tree House, Iron Chef II, Out of this World, and Art in the Garden. In the month of August, camps that visitors can choose from include LEGO robotics, Baking Boot Camp, and Fancy Nancy.